There may be a few forks in the career road that leads to the biomed department, and after arriving, there might still be an additional one. That was the experience for one clinical engineer in Utah who started out in Alabama in an entirely different field. 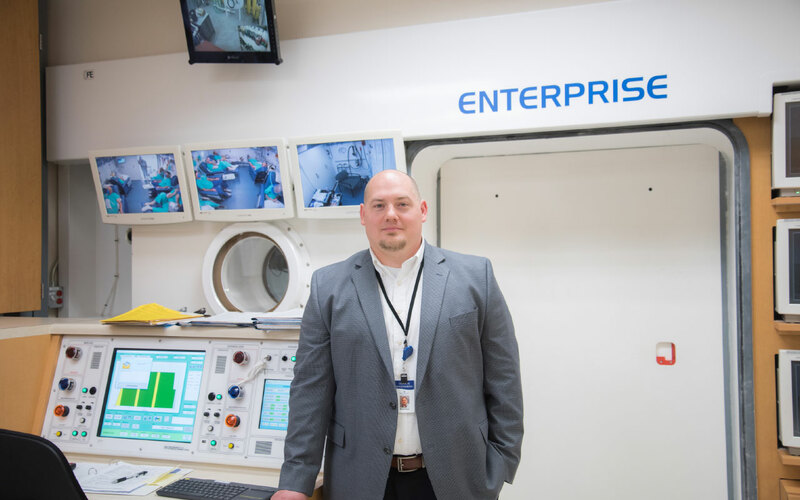 Matthew “Mat” Jones, a CE system cybersecurity analyst in the clinical engineering department for Intermountain Healthcare in Midvale, Utah, has just such a story. “I worked nearly a decade in northeast Alabama in the automotive manufacturing industry. I started from ground level, on the assembly line, building the same parts over and over. Eventually, I was given the opportunity to learn other roles in the Final Assembly Department, which led to a position in Quality Assurance. Although, I was in an entry-level position in Quality, I was able to learn the importance of compliance, standardization and documentation control,” Jones remembers. He says that at the time, he had finished his Green Belt in Six Sigma and was able to assist the company in achieving ISO 9001 standardization. “I eventually gravitated to an automation engineering position, where I maintained welding robots and an automated powder-coat paint line. I was given a second opportunity to work with Quality when the company needed to gain ISO/TS 16949 technical specification, in order to bid on new contracts. I found a great interest in the continuous improvement methodology and, I knew I wanted to work in a fast-paced technology field,” Jones says. After reading an article about surgical robots, he learned that health care technologists were in low supply. “I decided to change professions [and] I moved to Salt Lake City, where I had seen an increase in biomedical research. I started at a homecare repair depot, cleaning equipment and, at night, I went to community college taking a year of human anatomy and physiology,” Jones says. At the homecare repair depot, Jones worked as an equipment processing tech, performed oxygen trans fill and assisted in a wheelchair shop. “It wasn’t until I joined the team at Intermountain Medical Center, that I was able to dig in deeper. As a clinical engineer, I have had opportunities to work in a wide variety of clinical departments and serve as technical lead on multiple large projects,” he says. On the training front, after Jones accepted the position with Intermountain, he finished his training in Six Sigma as a Black Belt and certifications in Lean Healthcare. One of those projects was the installation and upgrading of Intermountain Healthcare’s electronic medical records (EMR) to the design telemetry control room. “My experience with many of the clinical systems and interfacing of medical devices to the EMR, is why I have such a passion for medical device cybersecurity. I found my career in clinical engineering very rewarding because I knew I was supporting those that could save lives. And now as a clinical engineering cybersecurity specialist, I am [able] to support those same professionals before they know there is a problem,” Jones says. Jones has been able to tackle some projects with other team members and engage in some interesting hobbies while away from work. “When Intermountain Medical Center needed to upgrade the physiological/telemetry system, it was like changing the tires without stopping the car. By strategically replacing certain departments first, we were able to run two systems at the same time. The legacy system was running in pseudo-ring topology, while the new system was being installed on star topology. This reduced the overall downtime, and patient safety concerns. When working at a large trauma center, many projects require several million dollars to implement; I found that focusing on saving money where you can, will add up quickly,” Jones says. He says that one of his favorite projects was designing a tele control room. All of the PCs were remoted in a data closet with each workstation consisting of four PCs and each tele tech monitoring up to 48 patients. “I enjoy all types of crafts, from woodworking to machine shop. I try to find ways to use techniques from one craft that can be used with another,” Jones says. “And this is how I found one of my passions, aquaponics, which is the combination of aquaculture and hydroponics. I started keeping an aquarium for ornamental purposes, where the science involved in maintaining an enclosed ecosystem, is what I find enjoyable. So, it was natural for me to find an extended ecosystem of aquaponics which combines raising marine life for food (aquaculture), and growing vegetables in water (hydroponics) in a closed loop system, really exciting,” Jones adds. Born and raised in northeast Alabama, the youngest of four, Jones currently lives in Salt Lake City, Utah with his wife of eight years. “All Over but the Shoutin’” by Rick Bragg and almost all of John Grisham’s novels. Anything from the Disney’s Marvel Cinematic Universe, especially the three Avengers team-ups. Momma’s jambalaya and Southern cornbread. Favorite part of being a biomed/CE system cybersecurity analyst? Why should this person be Professional of the Month?